The Hook Center was founded to foster a thriving system of education by cultivating innovative leadership, talented management, discerning governance, and astute public policies. With a concentration on partnership with school and district leaders, the Hook Center expands the impact of the MU College of Education and the University of Missouri through services, training, and translational research to improve the efficacy of educational institutions and policies. The Hook Center will catalyze the regeneration of educational leadership, management, governance, and policy in Missouri and the nation, leading to extraordinary educational outcomes for students. Harold S. Hook grew up on a dairy farm near Kansas City, Missouri. 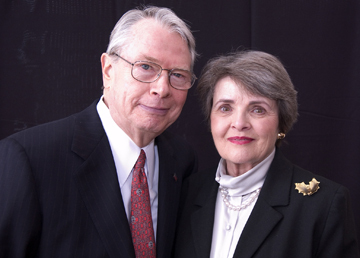 He and his wife, Joanne, are alumni of the University of Missouri, from which he also holds an honorary Doctor of Laws degree. After service in the U.S. Navy, he built a career in life insurance and financial services, serving as the chief executive of National Fidelity, United States Life, Cal-Western Life, and American General Corporation – where he spent nearly two decades developing the company into one of the largest diversified financial service organizations in the United States. Hook, a recognized management scholar and innovator, is the founder and president of Main Event Management Corporation, which was established in 1971. Hook created and marketed Model-Netics and MEM systems for use in a variety of business, governmental, and educational organizations. An Eagle Scout, Hook has served as the National President of the Boy Scouts of America. In addition, he has served on numerous civic, corporate, nonprofit, university, and school boards. Joanne Townsend Hunt Hook is a 1955 University of Missouri graduate in elementary education with a minor in home economics. She was a sophomore volunteer when she met and began dating Harold, then the president of the MU Student Union. After graduation, Joanne married Harold and they lived in Panama City, Florida, where Harold was stationed in the Navy. She was a substitute teacher for the Panama City School System and 3rd grade teacher at Tyndall Air Force Base before they were transferred to Charleston, South Carolina. Joanne became a full time mother and wife, raising three children, Karen, Tom and Randy. The Hooks now have five grandchildren. Joanne is active in Daughters of the American Revolution, Phi Beta Phi Alumnae Board and several volunteer organizations.